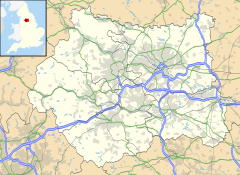 Guiseley (/ˈɡaɪzlɪ/ GHYZE-lee) is a small town in metropolitan borough of the City of Leeds, West Yorkshire, England. Historically part of the West Riding of Yorkshire, it is situated south of Otley and Menston and is now a north-western suburb of Leeds. It sits in the Guiseley and Rawdon ward of Leeds City Council and the Pudsey parliamentary constituency. At the 2001 census, Guiseley with Rawdon had a population of over 21,000, increasing to 22,347 at the 2011 Census. The A65, which passes through the town, is the main shopping street. Guiseley railway station has regular train services into Leeds, Bradford and Ilkley stations on the Wharfedale Line. Guiseley is also served by the stations of Menston to the north and Baildon to the south. There have been Stone Age and Bronze Age finds and a Roman road nearby. A Saxon settlement was around a spring which is now called Guiseley Wells and provided drinking water. The name is also Saxon (from "Gislic", a name and "ley" a clearing in woodland) and is listed in the Domesday Book as "Gisele." It was a largely farming community until the 18th century, when cottage-based woollen industry arose. In Victorian times it became industrialized, acquiring a railway connection in 1865 and a Town Hall (now the theatre) in 1867. Guiseley was an ancient parish in the West Riding of Yorkshire from the 12th century. The parish also included the townships of Carlton, Horsforth, Rawdon and Yeadon, all of which became separate civil parishes in 1866. In 1937 the civil parish of Guiseley was abolished and merged into the new Aireborough Urban District. In 1974 Aireborough was itself abolished and absorbed into the City of Leeds Metropolitan District in the new county of West Yorkshire. Guiseley's church, dedicated to St Oswald, was the centre of a large parish that included many surrounding villages. It was used by generations of the Longfellow family. Henry Wadsworth Longfellow's 5th great-grandfather left here for the New World in the 17th century. The rector of St Oswald's for several decades was Rev. Robert More (died in 1642), the father-in-law of the English explorer, Captain Christopher Levett. Patrick Brontë and Maria Branwell were married at St Oswald's and became the parents of six children, including Anne, Charlotte and Emily Brontë. The town is known for Harry Ramsden, whose fish and chip shop traded from a small shed next to the tram stop. In 1930 he opened "the world's biggest fish and chip shop". The original restaurant was closed in December 2011. The Wetherby Whaler group purchased the site and planned a £500,000 refurbishment to open during the summer of 2012. The new Wetherby Whaler restaurant opened on 22 May 2012. Many of the retail outlets in the town have been established on the converted sites of old factories or mills. Recently, an increasing number of stores of well known leading brands such as Argos, TK Maxx, Marks & Spencer (food), Asda Living, Currys, Costa Coffee, Next and Sports Direct have been opened in the area. McDonald's, KFC and Subway all have stores in the town. In addition to St Oswald's there is also Guiseley Methodist Church and Guiseley Baptist Church which was built in 1883 on Oxford Road in the old town, and the Kingdom Hall of Jehovah's Witnesses on Otley Road. Guiseley's professional football team, Guiseley A.F.C., play at Nethermoor Park. They played in the Conference North during the 2014–15 season, gaining promotion to the Conference Premier through the playoffs. Guiseley Cricket Club shares the club house and plays in the Airedale-Wharfedale Senior Cricket League. Aireborough RUFC play at Nunroyd Park. Local philanthropist Jonathan Peate gave Nethermoor Park (Guiseley) and Nunroyd Park (between Yeadon and Guiseley) to local people in the early 20th century. Two other parks were regenerated in 2011/12, Springfield Road and Parkinson's Park. Parkinson's Park was given to Guiseley in the 1930s by Frank and Albert Parkinson. By 2002 it had become an wasteland with frequent occurrences of antisocial behaviour. It is now owned by Bellway Homes, and its rehabilitation is supported by the Friends of Parkinson's Park. Guiseley is also home to England Athletics registered running club Airecentre Pacers. Harry Corbett, known for his children's television glove puppet character Sooty stage act, lived with his parents, who owned a fish and chip shop on Springfield Road. Tasmin Archer, whose co-written song "Sleeping Satellite" reached number one in the UK charts, and Maurice Lee of The Grumbleweeds lived in the town. Guiseley is situated on the higher land to the north of the Aire Valley. The A65 road passes through, there is a railway station and Leeds Bradford Airport is nearby. ^ "2001 Census Pdf" (PDF). Retrieved 20 September 2010. ^ "City of Leeds Ward population". Neighbourhood Statistics. Office for National Services. Retrieved 27 February 2016. ^ a b c d e f "A brief history of Guiseley". www.aireboroughcivicsociety.org.uk. Aireborough Civic Society. Retrieved 22 July 2017. ^ "History". Silver Cross. 2017. ^ "First Harry Ramsden's chip shop bought by Whaler Group". BBC News. 6 February 2012. ^ "Home". Retrieved 20 September 2010. ^ "Aireborough RUFC". Retrieved 20 September 2010. ^ "Parkinson's Park website". Retrieved 23 March 2012. ^ "Airecentre Pacers Running Club". Retrieved 1 November 2016. ^ "Home - Guiseley School Website". Archived from the original on 9 September 2010. Retrieved 20 September 2010. ^ "Aireborough Grammar School". Retrieved 20 September 2010. ^ "Tranmere Park". Retrieved 20 September 2010. ^ "St Oswald's C of E Junior School, Leeds :: Home Page". Retrieved 20 September 2010. ^ "Otley author - and son of a Grumbleweed - receiving rave reviews for debut novel". Wharfedale and Aireborough Observer. 17 June 2016. Retrieved 16 September 2018. Wikimedia Commons has media related to Guiseley. "The Ancient Parish of Guiseley". GENUKI. Retrieved 29 October 2007.